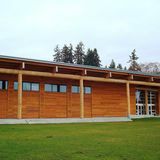 D'Suq'Wub, meaning "place of clear salt water" in the Southern Lushootseed language, has been the primary home of the Suquamish people since time immemorial. It is the ancient place on Agate Passage, the site of Old-Man-House village, the winter home of Chief Seattle and the heart of the Suquamish people. It is here - past, present and future - that the Suquamish people live on the land of our ancestors & our great-grandchildren.